G2 StakesPlaced and Grade One finalist earner of $85.288. 3 Wins in 5 starts. 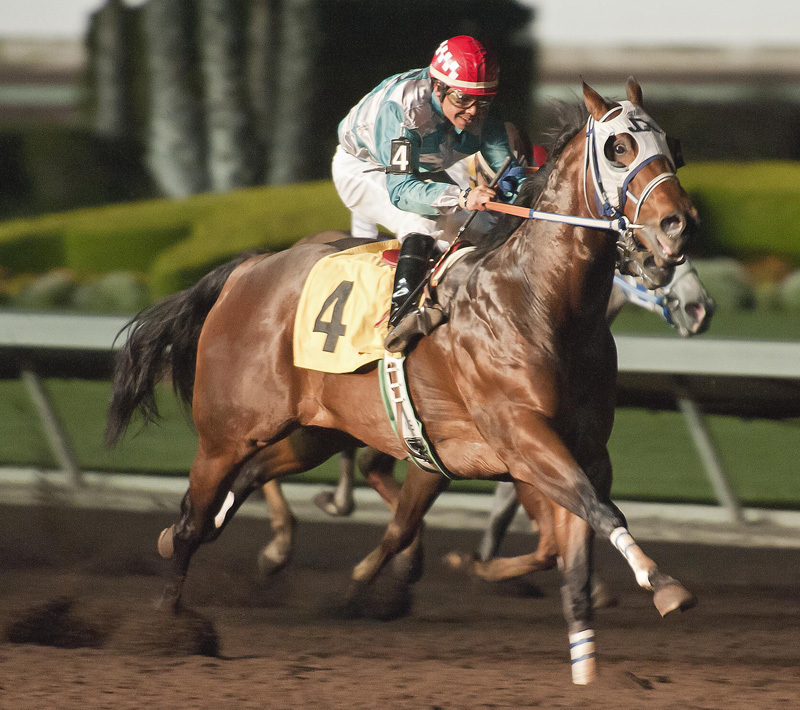 At TWO: 2 Wins:, finalist Golden State Million Futurity (G1); in 3 starts. At THREE: 1 Win, once 3rd (El Primero Del Ano Derby-G2) in 2 starts. Photo of Duke Kahanamoku qualifying for the El Primero Del Ano G2 at Los Alamitos. Named for the long-celebrated father of modern surfing, Honalulu-native Duke Kahanamoku was an Olympic gold medal swimmer and Hawaii's beloved ambassador to the world through much of the first half of the 20th century. The equine Duke Kahanamoku hails from top Quarter Horse bloodlines, which endowed him with a powerhouse build. This young stallion is a son of the 2006 AQHA Racing World Champion 3yo Colt Wave Carver, and is already making an impact at the races with his own offspring. - DUTCH SCHULTZ-QH SI 99 (2002 g. by Holland Ease-QH). 8 wins, 2 to 5 in QH races, $356,668, Superior Race Horse (2005), Register of Merit (2004), 1st El Primero Del Ano Derby-G2, Katella H., Cypress Sophomore H., 2nd First Down Dash H.-G3, Kaweah Bar H.-G3, 3rd Golden State Million Futurity-G1, Los Alamitos Winter Championship S.-G1, Finalist in All American Derby-G1, Los Alamitos Super Derby-G1, Los Alamitos Winter Derby-G1, Vessels Maturity-G1. (QH SPR=96) Last raced in 2007. SPIKE IT AND FLY-QH SI 104 (2003 g. by Corona Cartel-QH). 7 wins, 2 to 6 in QH races, $187,652, Superior Race Horse (2007), Register of Merit (2005), 1st Southern California Derby-G1, Cypress Sophomore H., 2nd Los Alamitos Winter Championship S.-G1, Finalist in Go Man Go H.-G1, Remington Park Derby-G2, Lazy E Derby [R]-G2, California Challenge Championship-G2, James Isaac Hobbs S.-G2, Oklahoma Horsemen's Associaton Derby [R]-G3, Altoona Derby-G3, All American Gold Cup-G3, Kaweah Bar H.-G3. (QH SPR=74) Last raced in 2010. ROYAL PROCLAMATION-QH SI 107 (2006 g. by #A Regal Choice-QH). 5 wins at 3 in QH races, $248,659, in NA, Superior Race Horse (2010), Register of Merit (2008), 1st El Primero Del Ano Derby-G2, 2nd Town Policy S., 3rd All American Derby-G1, Remington Championship Challenge-G1, Finalist in Rainbow Derby-G1, Remington Park Inv. Championship-G1, Los Alamitos Winter Championship S.-G1, Southern California Derby-G1, Bob Moore Memorial S.-G2; 3 wins in 4 starts at 4 and 5 in QH races, 671,085 Pesos ($55,264 USA), in Mexico, 1st Clasico Velocidad, Clasico Inaugural, Clasico Campeon de Campeones. (QH SPR=73) Last raced in 2011. 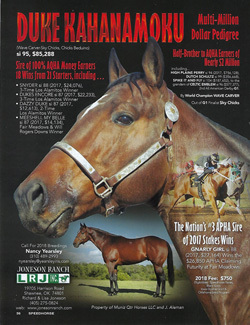 Watch Linda Ballet-QH SI 90 (2010 f. by Mr Jess Perry-QH). 3 wins at 2 in QH races, $110,918, Register of Merit (2012), 3rd La Pacifica H.-G3, Finalist in Golden State Million Futurity-G1, Ed Burke Million Futurity-G1, Golden State Derby-G1. (QH SPR=87) Last raced in 2013. Dam of 2 QH foals. Duke Kahanamoku-QH SI 95 (2008 c. by Wave Carver-QH). Stakes placed winner,see above. Last raced in 2011. Lite Up the Skies-QH SI 102 (2001 c. by Royal Quick Dash-QH). 3 wins at 2 in QH races, $14,784, Register of Merit (2003), 3rd AQRA President's Spring Futurity, Finalist in Yavapai Downs Futurity-G3. (QH SPR=67) Last raced in 2005. - - CELTIC EMBLEM-QH SI 96 (2013 f. by Apollitical Jess-QH). 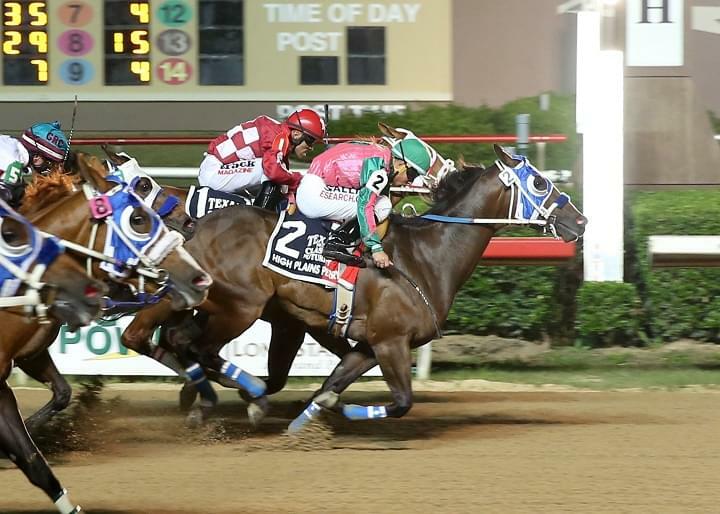 5 wins at 2 and 3, 2016 in QH races, $577,377, Register of Merit (2015), 1st Easy Jet S. [R]-G3, 2nd All American Derby-G1, Finalist in Remington Park Oklahoma Bred Futurity [R]-G2, Heritage Place Derby-G2. (QH SPR=98) Last raced in 2016. BANNISTER-QH SI 107 (2014 g. by Maknmoves-QH). 7 wins in 11 starts at 2 and 3, 2017 in QH races, $105,537, Register of Merit (2016), 1st Los Alamitos Wild West Futurity, Beehive Futurity, 3rd Los Alamitos Juvenile Challenge, Finalist in Los Alamitos Winter Derby-G1. (QH SPR=94) Last raced in 2017. Sky Bo Dash-QH SI 96 (2013 g. by Bodacious Dash-QH). 2 wins at 2, placed at 3, 2016 in QH races, $156,603, Register of Merit (2015), Finalist in All American Futurity-G1, Rainbow Futurity-G1. (QH SPR=66) Last raced in 2016. Big Sky Lad-QH SI 98 (2011 g. by Wave Carver-QH). Winner at 2 in QH races, $68,936, Register of Merit (2013), Finalist in Los Alamitos Super Derby-G1, Sunland Championship Challenge-G2. (QH SPR=83) Last raced in 2015. Hit the Heights-QH SI 95 (2004 g. by Stoli-QH). Winner at 3 and 4 in QH races, $35,309, Register of Merit (2007), Finalist in Southern California Derby-G1, Vessels Maturity-G1, Oklahoma Derby-G3. (QH SPR=70) Last raced in 2008. Sky Chicks-QH SI 92 (1993 f. by Chicks Beduino-QH). 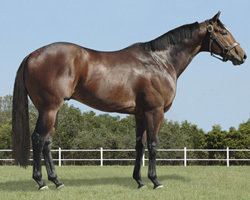 Stakes placed winner, see above..
Peyote Chick-QH SI 98 (1995 c. by Chicks Beduino-QH). 2 wins at 2 in QH races, $43,528, Register of Merit (1997), 2nd The Quarter Racing Journal S., Finalist in PcQHRA Breeders' Futurity-G1, Kindergarten Futurity-G2. Died 1998. (QH SPR=98) Last raced in 1997. SKYNLAJOLLA-QH SI 98 (2004 g. by Streakin La Jolla-QH). 5 wins, 2 to 6 in QH races, $71,005, Register of Merit (2006), 1st Town Policy H., Finalist in Los Alamitos Winter Derby-G1, Vandys Flash H.-G3. (QH SPR=59) Last raced in 2012..
Yakeeta Yak-QH SI 90 (2006 f. by Corona for Me-QH). Winner at 5 in QH races, $25,178, Register of Merit (2008). (QH SPR=59) Last raced in 2012. Producer. - - Hawk the Cash-QH SI 90 (2001 f. by Takin On the Cash-QH). Winner at 3 in QH races, $21,945, Register of Merit (2003), Finalist in Governor's Cup Derby [R]-G1. (QH SPR=83) Last raced in 2004. Producer. A Black Chick-QH SI 111 (1994 g. by Chicks Beduino-QH). 6 wins, 2 to 4 in QH races, $29,708, Register of Merit (1996), Finalist in Trinity Meadows Yearling Sale Futurity [R]-G2. (QH SPR=89) Last raced in 1998. THE PEARL-QH SI 90, by Vanaqua-QH. 3 wins at 2 and 4 in QH races, $9,943, Register of Merit (1977). (QH SPR=79) Last raced in 1979. Half-sister to FOR FLORENCE-QH SI 95 ($8,904, Superior Race Horse (1976), Register of Merit (1975), 1st Debutante H.), Truehood-QH SI 99 ($37,016, Superior Race Horse (1985), Register of Merit (1982), 3rd Marco Smolich H.).Dam of 4 QH foals, 4 to race, 2 winners, 3 ROM--.